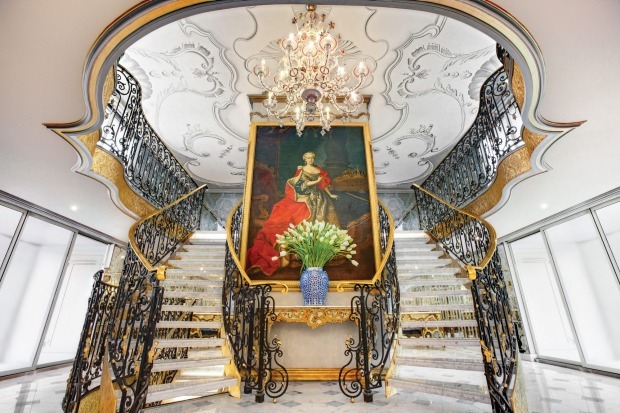 The spectacular lobby of Uniworld's SS Maria Therese river cruise ship. 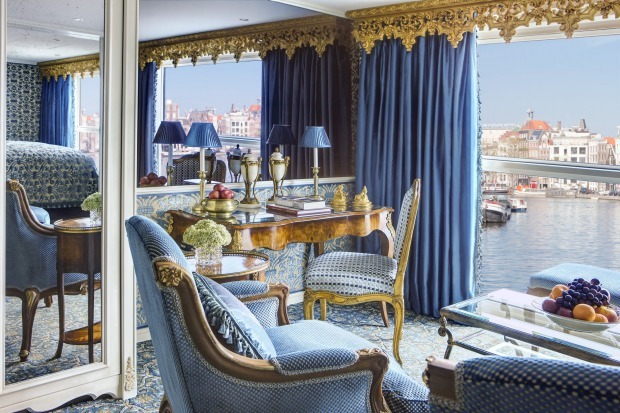 A suite on Uniworld's SS Maria Theresa. 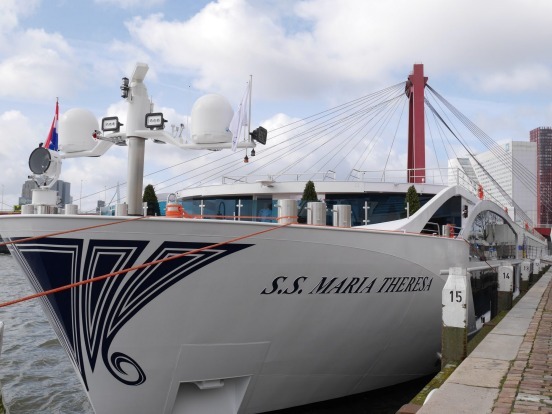 From outside, the Maria Theresa looks slick and minimalist. 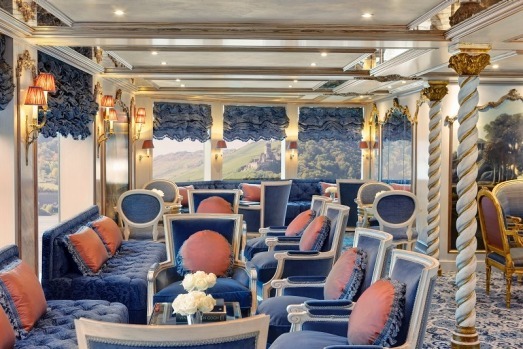 A lounge on Uniworld's SS Maria Theresa. 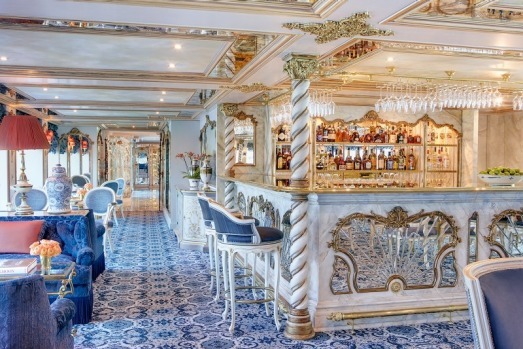 Cocktail lounge on Uniworld's SS Maria Theresa. 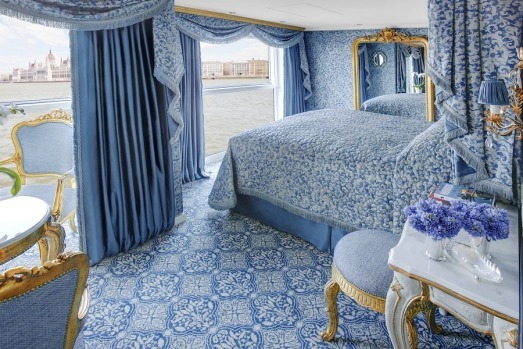 Opulent and elegant: Uniworld's SS Maria Theresa. On the outside, Maria Theresa presents the sort of sleek minimalism that would suit a Scandinavian toothpaste baron. I head up the gangway towards a 21st-century ship the taut white lines of which give no hint of the madness within. Yet beyond the gliding glass doors lies a shimmering 18th-century palace of gold leaf and chandelier crystals. The wobble-chinned, heaving-bosomed empress herself looms from a portrait large as a Hollywood billboard. Around it curves a double staircase designed for grand entrances, making me think I should have packed my whale-bone hoops and best wig. As first impressions go, Maria Theresa has an impact before any of its 150 guests even make it across the lobby's marble rink to the reception desk. 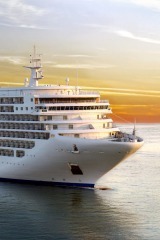 Thank heavens for a cruise company that hasn't retreated into bland, on-trend design. Why would you want to spend a week in a Freedom-furniture showroom? 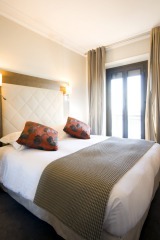 Why in a travel world of same-same airports and hotel rooms would you want more of the same on your river ship? Sure, Maria Theresa's decor isn't to my taste, but I admire the commitment. 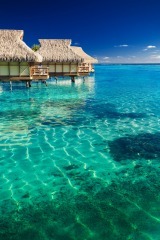 In fact, I hugely enjoy it. 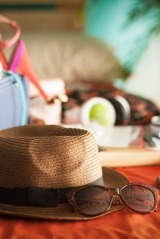 Travel is about immersing yourself in novel environments, not about seeking out what you have at home. Don't give me a beige sofa. Give me a plump blue sofa, as studded with buttons and tassels as a Hapsburg general's uniform. 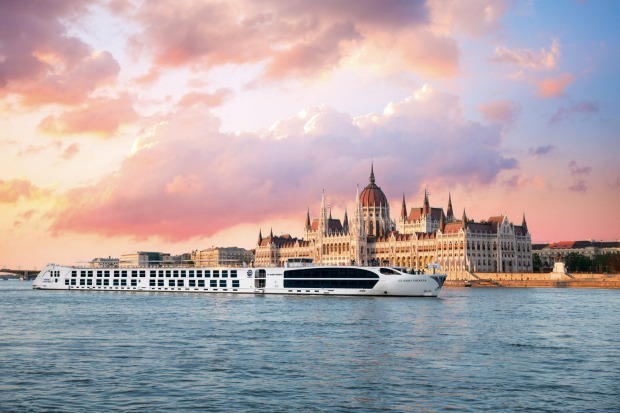 By the time I've been a week on this Danube ship, I begin to think I too should have light sconces in my home held up by bare-breasted nymphs, and a leopard-skin banquette for evening cocktails. On the outside, Maria Theresa presents the sort of sleek minimalism that would suit a Scandinavian toothpaste baron. 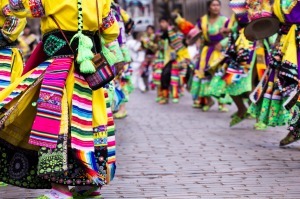 Uniworld's mad interior designs differ from one vessel to another, but share the same lack of restraint, eye-popping fabric patterns and wild colour. What's so pleasing is that there is full commitment to the decor. 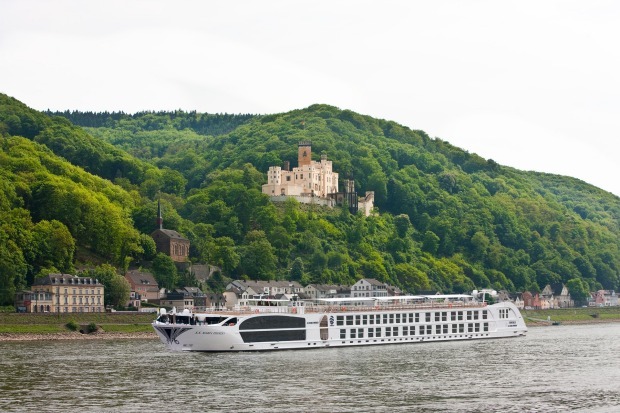 There's no exception for its largest and one of its most recent vessels, Maria Theresa. A crown is embossed on the floor of my shower, 18th-century prints line cabin walls, mirrors everywhere are aged with liver-spots to look as if they've been appropriated from an Austrian palace back in the days when mirrors were the ultimate in luxury. 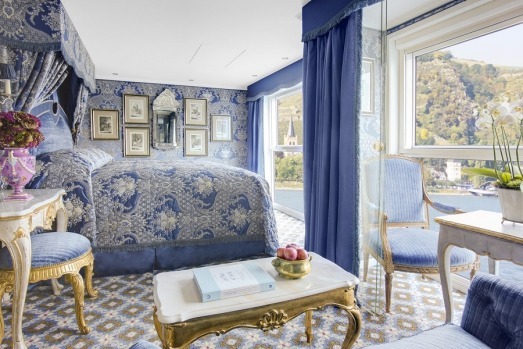 This ship has more French gilt legs than you see at the Folies Bergere, a greenhouse-worth of fresh flowers and enough gold leaf to make a baroque bishop feel inadequate. 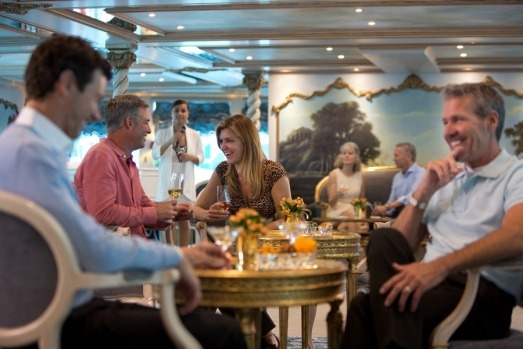 Only the sun deck, scattered with loungers and tables, and running the whole ship's length, abandons baroque decor. 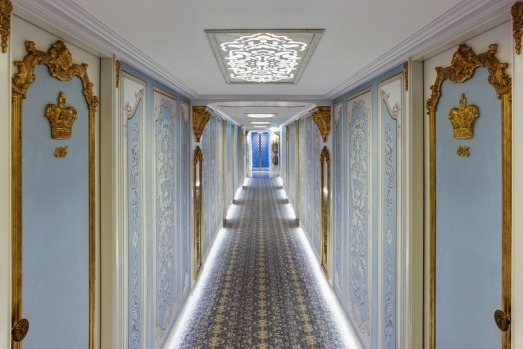 The overall impression of shimmering, shining opulence makes me feel I've wandered into Vienna's Schonbrunn Palace – appropriate on a ship that plies the Danube through the Hapsburg heartland. I doubt Austrian empress Maria Theresa lived this well, however. No chamber pots nor chilly draughts disgrace my cabin (number 328, category two), just a lot of mod cons beneath the 18th-century veneer, including both US and Australian power points, Egyptian cotton sheets, gushing showers, heated bathroom floors and high-tech touch buttons that produce pleasing lighting effects. The TV, concealed behind a mirror, would have been denounced as sorcery in the old days. 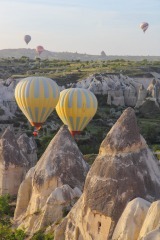 Even I feel that it's a little bit magic. Did Maria Theresa the empress have a cinema? I think not. 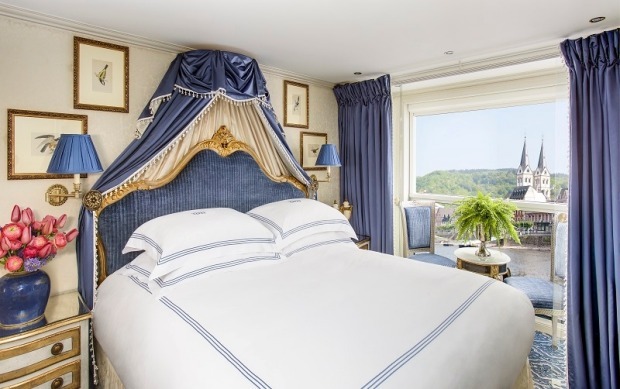 But Maria Theresa the ship has one, rather plush, with romantic two-seaters in buttoned blue velvet and old Hedy Lamarr cinema posters on the walls. (The glamorous screen seductress of the golden age was, I discover, Austrian.) 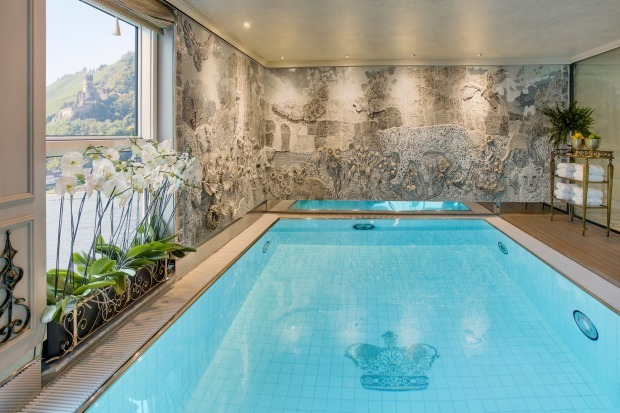 Nor did the empress have a mosaic-encrusted swimming pool, a very handy self-service laundry, nor a massage room (rather grandly called a spa). By the looks of her full-length portrait, if she ever had a fitness room, it went unused. 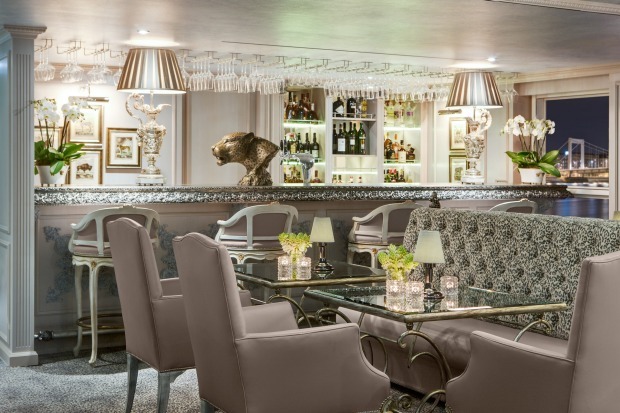 Other public areas on Maria Theresa include the Leopard Bar at the rear of the ship, the pleasing dove-grey decor of which provides my eyeballs with a rest as I knock back my River Cosmo (vodka, triple sec, pineapple and cranberry juices). 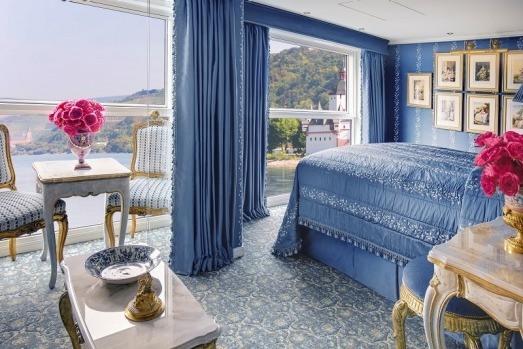 The ship's main Hapsburg Lounge is a spectacle of blue-velvet sofas on which to swoon, and murals depicting bucolic 18th-century Austrian life. Curtains are as ruffled as a cancan dancer's skirt, and porcelain ginger jars add a touch of chinoiserie. This is the place for lectures, leafing through coffee-table books, good coffees, more cocktails. 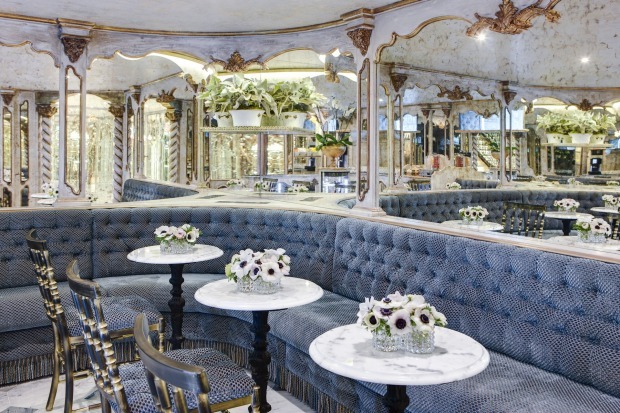 A compact Vienna-style cafe of cast-iron and marble tables, graced with erupting orchids, channels a more turn-of-century atmosphere. You could perhaps discuss your neuroses here over a slice of the Sachertorte that turns slowly in a glass case like some exotic museum-treasure of a lost civilisation. The mostly retired American passengers, though, seem a happier lot, tucking into toffee apples and hotdogs. These snacks are really just for folks with the jetlag munchies at strange times. 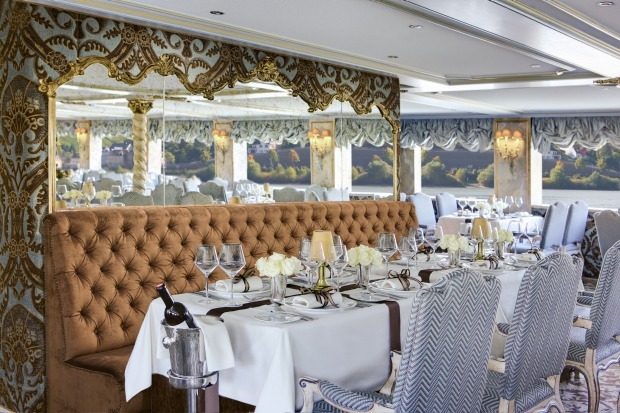 The ship's main dining venue, the Baroque Restaurant, provides feasts three times daily. 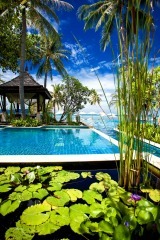 (You can eat more simply in the Leopard Bar if you don't fancy a four-course meal.) The restaurant is crammed with herringbone chairs, padded banquettes, twist-fluted columns and mirrors that ping-pong light off glassware. The ceiling is low, the tables close together and the noise levels sometimes high. 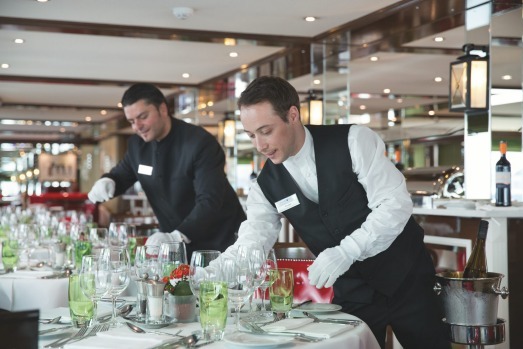 Waiters, mostly from Eastern Europe, provide sedate and attentive service. 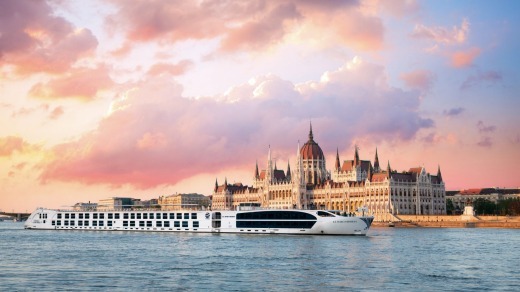 Uniworld has the best restaurants on the river. 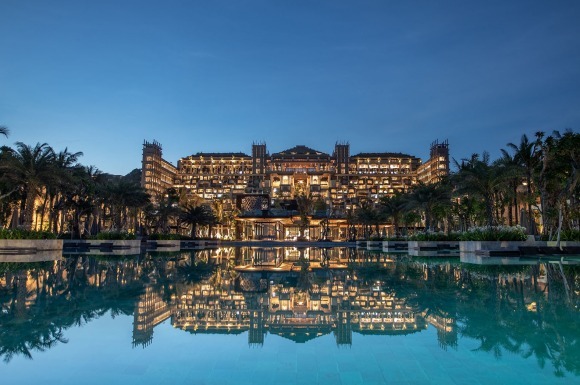 It doesn't stint on quality ingredients or quality inclusive wines; emphasises regional cuisine; and provides upmarket buffet spreads for breakfast and lunch, and sophisticated a la carte evening dining. 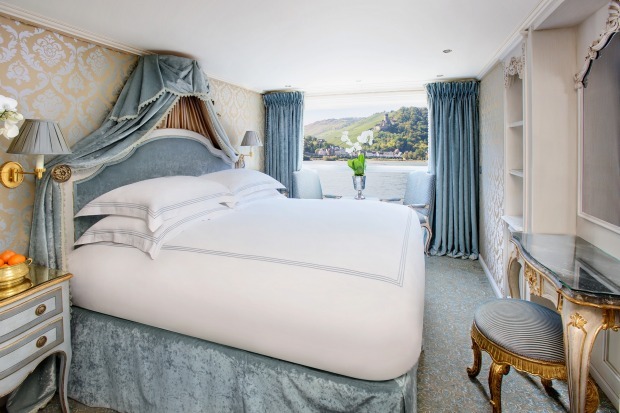 Maria Theresa is the third Uniworld ship I've travelled on and doesn't disappoint. Regional food ranges from Budapest-style paprika soup with sour cream to German sausages and after-dinner samplers of Austrian cheese. A half-dozen local beers and interesting Austrian wine varietals such as Blauburger and Zweigelt are served here and in the lounges. Menus offer vegetarian and "lite" options, but in the interests of period accuracy I rather feel I ought to indulge in meals that would have pleased Maria Theresa. Hard to resist foie-gras creme brulee with duck breast, or Slovakian sauerkraut soup with smoked sausage and bacon. Warm hazelnut-chocolate pudding with orange sauce and whipped cream is a most decadent dessert for a decadent ship that has me immersed in well-organised luxury, and feeling like the most pampered of empresses. Brian Johnston travelled as a guest of Uniworld.